If you have spent any time at all watching television, you have probably noticed the upsurge of advertisements for gold buying businesses. The economy experiences swings up and down over periods of time that can make precious metals and gems much more appealing to the investor. A question that comes to mind in regard to the best bang for the buck deals with gold and diamonds. What is the best option in a down market environment, diamonds or gold? Diamonds are anyone's best friend, especially when they are on sale. The answer can depend on recent history prior to a down-turn in the business sectors. During more prosperous times, records indicate that diamonds are more popular overall among jewelry and precious metal items. While being popular, diamonds are also more costly. Oddly enough, when the economy is in negative territory, diamonds will cost less; however, the opportunity to sell diamonds is diminished for obvious reasons. When those who usually would have money to pay for the diamonds in jewelry form or on watches, they are not in a position to do so at a time of low employment numbers. On the other hand, gold has a very different opportunity. As a rule, gold is a liquid asset and can be sold daily in a market environment being traded. Buy gold in a positive or negative market atmosphere as a plus and asset to the investor. Commonly, those who trade gold on a regular basis find it a great hedge against a weak dollar that is indicative of a down economy. Comparing gold against diamonds, it is far better to make gold the investment for a diversified portfolio. Diamonds are always a wonderful purchase for gift-giving and showing love and devotion to family and friends. 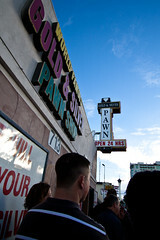 Could it really be the the hottest show in Vegas is the show about the Gold and Silver Pawn Shop. There are some 5,000 people a day lining up to see the Pawn Stars and that’s more than are lining up to see Celine Dion! The Stars themselves are pretty amazed and even “overwhelmed”, says assistant manager Jason Heatwole. The store has some strange and magnetic pull and so far as we can research it spans one of the most broad viewing demographics that there is running. We are delighted and we can attest to the fact that pawn shops are getting foot traffic from everyone! We see all ages and sizes coming through our doors and we wake up everyday wondering just what treasure we’ll find and who’ll be by later to discover it. 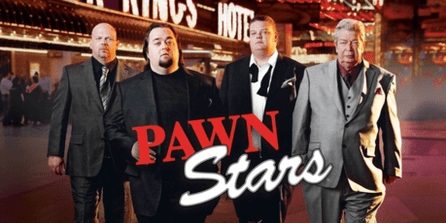 What do YOU think of the Pawn Stars? What do you like? What do you hate? Who do you like, and who do you hate? Let us know your opinion on the Pawn Stars epidemic! ON WHO WANTS TO BE A MILLIONAIRE? There’s really no courtesy for poor Chumlee. If you ask some people he’s the most decent person on the show. Still, he’s the verbal whipping post of Pawn Stars’ Rick. I’m rooting for Chumlee to be the richest one in the bunch. Long after the lame insults and bad jokes are gone and the cast has all bought their own island to retire on, it will be Chumlee (in his Maserati) that will go on to spawn a movie based on his life! Well, maybe not. But still, he’s a sweet guy and the cast could ease up a bit on the ridicule. So, Chumlee took his shot at the million along with Corey and Rick. Rick continues to belittle and make fun of Chumlee in this YouTube clip: http://www.youtube.com/watch?v=FLg-j4mJ4rw – but when it’s all said and done we’ll see who rakes in the dough or who blows it. Boca Raton Pawn is located in Boca Raton, Florida directly across the street from Mizner Park on Federal Hwy. Boca Raton Pawn specializes in short term pawn shop loans on a wide variety of items such as: jewelry, watches, diamonds, precious metals, art, automobiles, collectibles, tools, electronics, musical instruments and much more. If you have something of value that we have not mentioned, just give us a call or email for a free evaluation. Boca Raton Pawn is one of the largest buyers of jewelry, watches, diamonds and precious metals in Boca Raton. We are located conveniently on Federal Hwy directly across the street from Mizner Park.